Recently renovated and updated, this 25-room mansion is a glorious example of the opulence of the Victorian era. Built in 1882, it is distinguished by a three-story castle-like tower. Ornate fireplaces, carved woodwork and original chandeliers mix with Victorian furnishings. The carriage house features a gift store and a small theatre in which a film on the architecture of Atchison can be viewed. 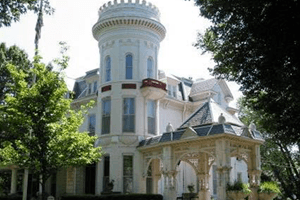 This opulent, Victorian mansion is listed on the National Register of Historic Places. Groups over 10 people, please call for tour arrangements. The Carriage House Gift Shop offers unique gifts and memorabilia as well as a short movie on the historic homes of Atchison.